According to the World Economic Forum (WEF) report, Lesotho is ranked first in Africa for bridging the gender gap and eighth in the entire world - with 95% of women able to read and write, compared with 83% of men. Women can take up important positions in the job market and can be as competitive as men. It’s only one side of the story. Lynn Brown was sharing her point of view about gender sensitive agriculture in the Breakout session about under-nutrition 50% of Lesotho's population lives in the rural areas, and legal right granted to rural women could change gender preferences on food production and role for men and women. However, when we talk about empowerment of women farmers and recognize their needs in agriculture, we need to understand the cultural context within the country, moving from the traditional male and female power-relation in society, and try to understand and see through the lens of female’s role in urban and rural area, and female’s power-relation within a family. Pointed out by Lynn Brown, who works formally for Would Bank for the World Food Program, we should not just imply western perspectives of women empowerment to developing countries. Male and female's role in the farm As we might know, traditionally women farmers have less access to land right, good soils, resources, trainings, inputs. Besides working on their own food crop fields, women have to take care of the family such as preparing food, fuel, water and childcare, as well as fertilizing manure in their husbands’ cash crop fields and storage of food . All these factors explain women’s yields are in average 30% less than men’s and they are only labeled as ‘male labor, child labor, and mother-in-law labor’. "It's not just the men that are holding women back, it is also the mothers," Lynn says. She explains that in some cultures and countries, mother in-law are ‘over-ambitious’ and they own most resources in a farm household, not only the men. Green revolution – a driver to malnutrition? 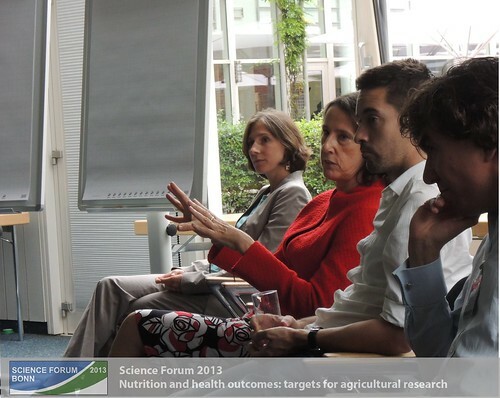 There are lots of discussions during the Science Forum in Bonn regarding how to integrate nutrition and health efficiency into agricultural research to boost the potential for agriculture-food-system to influence nutrition at larger scale. Mentioned by Lynn, and also one of the keynote speakers Prabhu Pingall from Cornell University, during the Green evolution in the 40s to 60s, mechanization and intensification of agriculture production boosted yields of staple grains. As a result, prices for rice and wheat went down rapidly, but at the expense of high relative prices of micro-nutrients dense food, such as horticulture, livestock products – milk and meat. For smallholder farmers, they can’t get access to nutritious food and so they are more prone to have health problems such as Amelia – the birth defeat of lacking one or more limbs. Food or cash- based safety net program - which one helps? Prabhu quoted from an Indian woman farmer “Cash can go away, but not foods”. Here we see how farmers see food as their basic assets but not cash. As Lynn stated in her study about the efficiency of food-based safety nets in helping vulnerable households manage food insecurity, for the poorest of the poor, one of their key concerns is access to sufficient food for a healthy and active life. Food-based safety nets are therefore an important instrument for some of the poor and food insecure who are vulnerable to critical levels of food deficit. Does it mean that the conventional way in mainstream development policy to deliver income to the poor is a brake on the rural development process? The fact is that in most African countries in rural farming households, is it usually the male farm head is responsible for cash crop farming to generate cash for the family. And the woman is left without control of main crops or income when the family is getting more in the direction of commoditization. In worldwide studies, safety nets, both food and cash based, can promote the graduation of households out of chronic food insecurity. They enable the poor to engage in livelihood strategies. Therefore, we see the different point of view from the farmers and economists. Coming back to the example of women’s right and power-relation in Lesotho, maybe it’s time for us and the researchers to address more on gender-sensitive agriculture, and focus more on agricultural policies that aim to redress gender inequalities. As a development worker or policy maker, we should ensure that development interventions in the agriculture sector are effective and can achieve enduring positive impacts on the lives and economic potential of rural women, men, girls and boys.